The civilization was in the Indian subcontinent. It was discovered by archaeologists in the 1920s. It developed along the Indus River and the Ghaggar-Hakra River. The areas are now in modern Pakistan, north-west India and Afghanistan. The civilization started during the Bronze Age. The height of its development was between 2500 BC and 1500 BC. Including the civilizations directly before and after, it may have lasted from the 33rd to the 14th century BC. 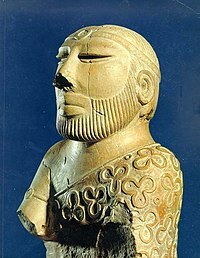 The Indus Valley civilization covered a large area – from Balochistan (Pakistan) to Gujarat (Republic of India). The first city to be discovered by excavation (digging up) was Harappa and therefore this civilization is also known as 'Harappan Civilization'. They were good builders. The ruins of the site shows skillful design. Their buildings had two or sometimes more storeys. The bathrooms were attached to the rooms. One of the unique features of the city was its elaborate drainage system. A brick-lined drainage channel flowed alongside every street. Removable bricks were placed at regular intervals for easy cleaning and inspection. The harappan traders used seals on the knots of the sacks to be transported to make sure that they were not opened during the journey. Nobody knows how to read their writing system. ↑ Shinde, Vasant.S. ; Kim, Y.J. ; Woo, E.J. ; Jadhav, N.; et, al. (2018). "Archaeological and anthropological studies on the Harappan cemetery of Rakhigarhi, India". PLOS One Volume, 13(2), e0192299. ↑ Allchin, Bridget 1997. Origins of a Civilization: the prehistory and early archaeology of South Asia. New York: Viking. ↑ Masson, Charles 1842. Chapter 2: Haripah, in Narrative of various journeys in Balochistan, Afghanistan and the Panjab; including a residence in those countries from 1826 to 1838. London: Richard Bentley, p. 472. This page was last changed on 8 April 2019, at 06:56.